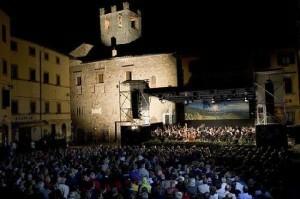 The Tuscany hill town of Cortona is presenting to all the national and international visitors fantastic concerts and events: it is the Tuscan Sun Festival , an annual summer festival of music and arts. The 2011 edition will start July 30 and it will be running through August 7. Why don’t you buy tickets ahead if you plan to go there? The Tuscan Sun Festival will amaze you with music and arts events taking place inside the medieval town of Cortona, in the province of Arezzo, Tuscany. This beautiful areais an ideal vacation spot. You can taste here and in the surronding the classic Italian food, with a selection of world-famous wine as the many varieties of Chianti. Cortona is very popular, especially in summertime. A daily program will experiment fine arts, culinary and wine, wellness, and local culture and history. Fab setting for the Festival is the Teatro Signorelli. Since 2003, Barrett Wissman and cellist Nina Kotova are the curators of the Tuscan Sun Festival that creates a warm atmosphere for both artists and audience. The Festival has then grown into an annual event presenting prominent musicians, gaining also the production by the renowned arts management company IMG Artists. Among exhibitions, wine and food tastings, lectures you will feel the vibrating “vibe” of the astonishing Italian countryside in Tuscany together with the beautiful fluer coming directly from the artistic production inside the festival. This entry was posted on Sunday, July 17th, 2011 at 6:53 am	and is filed under Events in Italy. You can follow any responses to this entry through the RSS 2.0 feed. You can leave a response, or trackback from your own site.